The University of New Brunswick today announced the creation of a postdoctoral fellowship program focused on innovation. Thanks to a $1.25 million gift from The McCain Foundation, the new fellowships aim to equip PhD graduates with the resources they need to transform their research into a product ready for market. These two- to three-year fellowships are valued at $50,000 per year and will be awarded competitively on an annual basis. The McCain Foundation Postdoctoral Fellowships in Innovation are designed to attract top early-career researchers to UNB. Over the course of their tenure, they will deepen their expertise in a specialist subject under the mentorship of faculty and through partnerships with industry leaders. UNB President and Vice-Chancellor Dr. Eddy Campbell believes the McCain Fellowships will play a key role in driving discovery, expanding knowledge, and advancing the economy in the province and beyond. Linda McCain, chair of The McCain Foundation, believes that the McCain Foundation Postdoctoral Fellowships in Innovation will provide unique training opportunities for early-career researchers. “We believe that these fellowships will enhance the recipients’ specialized expertise and also give them valuable skills that will translate their ideas into more opportunities for themselves and others in New Brunswick,” said Ms. McCain. The inaugural recipient of the McCain Fellowship is Dr. Edward Cyr. 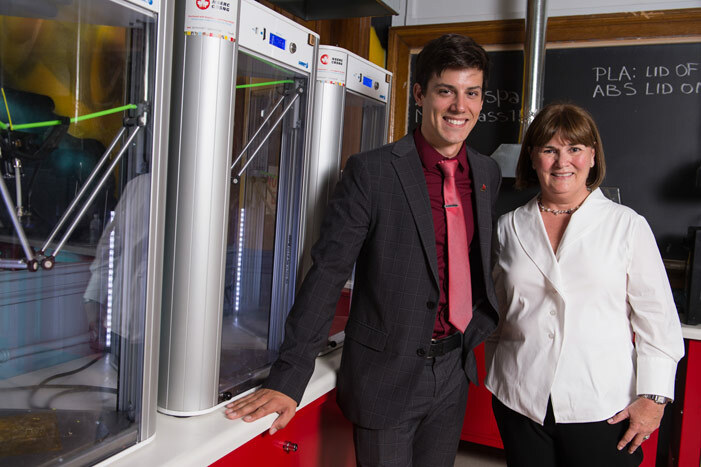 He came to UNB from the University of Waterloo in May of this year, and immediately began building his research program at UNB’s new Marine Additive Manufacturing Centre of Excellence. He is investigating the role that artificial intelligence and additive manufacturing play in the evolution of printed materials such as advanced stainless steels and aluminum alloys. He expects that the results will have applications in the marine industry, as well as the automotive, construction, and aircraft industries. Photo: Edward Cyr, inaugural recipient of a McCain Foundation Postdoctoral Fellowship in Innovation at the University of New Brunswick, with Linda McCain, chair of The McCain Foundation. Dr. Cyr is working on futuristic applications in 3D printing (Cameron Fitch / Photo UNB).